Beans belong to a family of plants (the Leguminosae) which, with the possible exception of the grasses, ranks first in agricultural importance. There are many genera, species, and varieties of beans. The most important beans grown in the United States are the kidney bean (Phaseolus vulgaris) and lima beans (Phaseolus limensis and P. lunatus). Unlike the pea, which is a hardy cool-season crop, beans are sensitive to frost and require a warm soil and a warm season for their growth. The Wardwell's Kidney Wax variety was used for root investigations. This is a wax-podded variety of bush bean. The crop was planted May 18, an earlier planting having frozen. The plants were spaced 6 inches apart in rows 2.5 feet distant. Early Development.--The bean seedling is characterized by a very vigorous development of the taproot. Plants only in the cotyledon stage, but grown in warm, mellow soil, often have well-branched taproots 12 inches long. Root development in the field was first examined June 18. The plants were already 5 to 6 inches tall and had a spread of 10 inches. Each had about 10 leaves, the leaflets being 3 to 4 inches long and 2 to nearly 3 inches broad. The total leaf surface averaged 1.4 square feet. 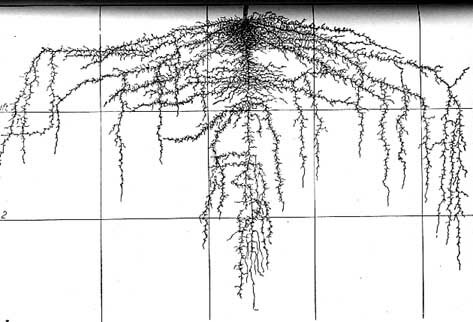 The root system was characterized by a strong, nearly vertically descending taproot and multitudes of long, horizontal branches arising mostly in the 2- to 6-inch soil level (Fig. 53). Some of these large branches, as in the lima bean, were adventitious, arising from the base of the stem. Although a few of the horizontal roots were over 2 feet long, their course was so devious that the maximum lateral spread was slightly less than 2 feet. Usually only about 25 roots per plant exceeded a length of 6 inches. Shorter ones were very numerous. 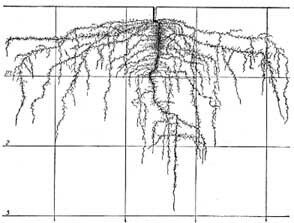 For example, between depths of 3 and 8 inches there was usually found a total of 21 roots per inch, although at greater depths they were less numerous (e.g., 7 per inch between 9 and 14 inches, inclusive). Fig. 53.--A month-old root system of Wardwell's Kidney Wax bean. As a rule many of the shorter, horizontal roots, only 2 to 4 inches long, were unbranched or only poorly furnished with laterals. On the longer ones branching occurred at the average rate of 10 branchlets per inch. These varied from 0.2 to 2 inches in length. A very few were 4 to 8 inches long and possessed branches of the third order. Thus the soil to a depth of 8 inches was quite well occupied by a network of rootlets. These are shown in Fig. 54 which is a surface view of the roots in the first 6 inches of soil. Fig. 54.--Surface view of the roots of the bean in the first 6 inches of soil. Compare with Fig. 53. A comparison of the horizontal view with the vertical one gives an adequate picture of the root extent and position. That the roots were elongating rapidly was shown by the 3 or more inches of unbranched root ends. Also the future, obliquely downward course could already be predicted by the position of the root termini. The taproot, below the 8-inch level, was well clothed with rootlets (Fig. 53). Only those exceeding 3 to 6 inches in length were rebranched. The last 5 inches of the turgid, thick, white taproots were quite smooth, although considerably kinked and curved from penetrating the compact soil. A maximum depth of 27 inches was ascertained. Midsummer Growth.--A second examination was made about a month later, on July 14. The plants were now nearly 1 foot high and had a spread of approximately 1 foot. Those of average size possessed about 18 large leaves, the largest of which were over 1 foot in width. The largest leaflets had a length and diameter of 6 and 5 inches respectively. The transpiring surface had increased to 5.5 square feet. The plants were blooming profusely and numerous young fruits were growing vigorously. Fig. 55.--Root system of kidney bean about 2 months old. The roots too had made considerable growth, although this was not so marked as in many other vegetable crops. The lateral spread reached a maximum of 30 inches, the most widely spreading roots sometimes ending in the surface foot of soil. Where the tips of the roots had been injured or destroyed, numerous laterals arose from the root ends and some of them pursued the course which would have been taken by the main root. This phenomenon of the growth of laterals being promoted by injury to the main branch has been repeatedly observed among many vegetable and field crops. The taproots had also increased their depth from about 27 inches at the June examination to 3 feet. Likewise the working level (exclusive of taproot) which scarcely exceeded 12 inches, had now been extended to an approximate depth of 20 inches. As before, considerable variation was found in the total number of large main roots. On the plant selected for drawing, most of these, as in the lima bean, arose from the base of the enlarged stem. Sometimes the taproot furnished more of them. A comparison of Figs. 53 and 55 shows that the roots on the plant selected to represent the later stage are scarcely as horizontal as those in the earlier drawing. This is largely due to variations in the individuals. The downward growth of these widely spreading, as well as the more obliquely growing, roots is here well under way. These strong main or lateral roots had diameters of 2 to 3 millimeters and were at least 1 millimeter thick throughout their course. The rate of branching was, as before, about 10 laterals per inch of root. They varied from 3 to 15 but usually approached the higher number. Many of them were only 0.2 to 1 inch in length, especially on the younger portions of the older roots and on the longer branches of the old ones. The latter were now abundant and ranged from over 1 inch to 6 inches in length. They were usually profusely rebranched, roots of the fourth order being not uncommon. Frequently, the branches occurred in clusters of threes on opposite sides of the roots. The general direction of these large branches, their lax and often sinuous course, and the degree of branching may best be visualized by a study of the drawing. As regards the taproot, it plays an important rôle. Filling the soil with its numerous branches just below the plant and extending considerably beyond the working level of the other roots, it continually drew upon new sources of supplies. Although some taproots were quite vertical in direction of growth, others pursued a very devious route as is shown in the drawing. As before, many short branches came from the older, shallower portion. These were better rebranched than at the earlier examination. Moreover, numerous, long, well-branched laterals, running in various directions, had developed and added greatly to the absorbing area. As on all the major roots, and indeed many of the smaller ones, the 3 or more inches of unbranched, glistening white tips showed that the plants were still growing rapidly. Mature Plants.--A final study of the kidney bean was made Aug. 5. The very leafy plants were about 13 inches tall and had a total spread of 15 inches. Although some were still blossoming, most of them had an abundance of mature pods. That they were fully grown was shown by the drying of some of the leaves. 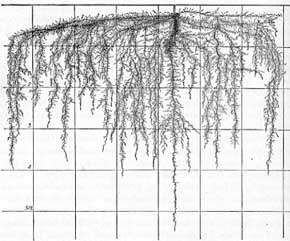 The roots had not increased in lateral spread but the taproots and some of the longest main laterals (including those arising adventitiously from the stem) had extended to depths of 40 to 46 inches, The working level had also been greatly increased, i.e., from 20 to 36 inches. Root branching was very well developed to the 3-foot level and to a distance of 2 feet on all sides of the plant. Many roots extended deeper. A few, especially the deeper portion of the taproots, showed signs of decay. Summary.--The kidney bean rapidly develops a deeply penetrating taproot. On plants 31 days old and 6 inches tall this reaches a length of over 2 feet. Branching is profuse throughout but especially in the 10 inches next to the surface. Roots from the base of the stem and from the taproot extend horizontally but deviously in the second to the eighth inch of soil to distances of 12 to 24 inches. With the numerous branches they constitute the bulk of the absorbing system which is distinctly superficial. A month later, when blossoming is profuse and fruits beginning to form, the roots are more extensive. The taproot has increased its depth to 3 feet and the working level to 20 inches. It is widely branched even in the second foot of soil. The main horizontal branches have extended the lateral spread to 30 inches and have branches which penetrate far into the second foot of soil. When the plants are nearly mature, the soil to 2 feet on all sides is well ramified to a working level of 3 feet and numerous roots extend 1 foot deeper. Thus the general root habit of the kidney bean is not greatly unlike that of the pea although the lateral spread and depth of penetration are somewhat greater and the deeper soil, just beneath the plant, somewhat more thoroughly occupied. The large lima bean (Phaseolus limensis), although a perennial in the South where it is of considerable commercial importance, is grown as an annual in northern United States. It is a vigorous grower but requires higher temperatures and a longer growing season than the common garden beans. It is a stout, high-climbing plant although bush or dwarf forms do not climb. Burpee's Bush Lima bean (variety limenanus) of the large-seeded, flat type was planted June 2 in rows 30 inches distant. The seeds were placed 6 to 12 inches apart in the row. Early Growth.--The root system was first examined 2 weeks later on June 18. The cotyledons were yellowing and nearly every plant was furnished with two leaves each about 4 inches long and one-half as wide. The total leaf surface was 24 square inches. The plants averaged 5 inches tall. A strong taproot extended from the base of the stem and reached a depth of 13 inches. The very numerous, mostly horizontal branches were longest above (maximum, 9 inches) and gradually became shorter at greater depths, thus giving a conical shape to the root system as a whole (Fig. 56). No roots were found in the surface 2 inches of soil but numerous, large, adventitious roots arose from the base of the stem and spread widely just below this soil level. They were growing rapidly and the last 3 inches were quite unbranched. Otherwise branches of the first order only 0.3 to 2 inches long (but mostly short) occurred at the rate of about 8 per inch. From the older portion of the taproot, i.e., the first 5 inches, laterals arose in great numbers, often as many as 30 per inch. These varied in length from about 4 inches on the older part of the taproot to 1 millimeter on the younger portion. The last 4 inches of the taproot were unbranched. Fig. 56.--A 16-day-old root system of Burpee's Bush Lima bean. Midsummer Growth.--About 5 weeks later, on July 24, a second examination was made. The plants were 10 inches high and in bloom. The stout stems bore approximately 33 leaves each. The largest leaflets were 3.5 by 2 inches in length and breadth, respectively, and the total transpiring surface was 4.3 square feet. The root system also had made a good growth. The lateral spread had increased to over 2 feet and a depth of nearly 3 feet had been attained. A root system was usually composed of a taproot and 6 to 8 large laterals arising from the base of the enlarged stem, although there always were numerous, smaller rootlets. The taproot pursued a somewhat devious downward course, often kinking and turning either in long, graceful curves or abruptly and penetrated deepest, 33 to 35 inches. The more superficial large roots spread laterally, often 1 to 2 feet in the surface 8 inches of soil, and then turning more obliquely or even vertically downward reached depths of 20 to 30 inches. 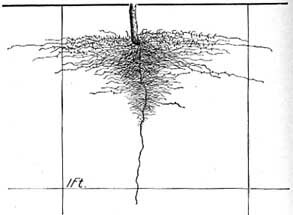 Still other main roots, running more obliquely downward, filled in the soil volume between the widely spreading laterals and the area occupied by the taproot and its branches (Fig. 57). These large roots were 1 to 2 millimeters in diameter and maintained this thickness throughout their course. Fig. 57.--Root system of lima bean at the time of blossoming (July 24). Branching on the laterals was somewhat variable but, in general, it was profuse. The shorter branches were simple, mostly only 0.3 to 2 inches long, and occurred usually at the rate of 4 to 12 per inch. The longer branches, i.e., those exceeding 2 to 3 inches in length were practically all furnished with laterals and at a rate similar to that of the main branch. Frequently, they were 9 to 15 inches in length. On the taproot branching was very profuse; 25 to 28 laterals 0.2 to 4 inches long occurred on each inch through the first few inches of its course. Branching was especially pronounced in the furrow slice (first 8 to 9 inches, Fig. 57), some of the horizontal branches spreading rather widely and sometimes giving rise to long, vertically penetrating rootlets. At greater depths they showed a distinct tendency to spread a few inches and then turn downward, often paralleling the course of the taproot for 1 foot or more. The longest branches were already furnished with tertiary roots. Thus the plants had a very efficient absorbing system. Maturing Plants.--The final examination was made Aug. 25. The plants were well developed and in fruit. They were 19 inches high, had a total spread of tops of 30 inches, and had not yet begun to dry. About 25 branches were found on plants of average development. These were covered with an abundance, of large, green leaves. Many large pods, nearly 5 inches long and over 1 inch wide, as well as numerous smaller ones, were found on normally developed plants. Blossoming had just ceased. The underground parts had made a striking development. The lateral spread had doubled, now extending to a maximum of 4 feet; the depth of penetration had been increased from 3 to 5.5 feet; and the working level to 45 inches. Usually the stem extended 2 to 2.5 inches into the soil and gave rise to a deep taproot on its terminal portion and almost equally large laterals from near its base. The latter were usually 7 or 8 in number (sometimes there were as many as 11) and in length and degree of branching they were often quite as important as the taproot. In cases where these lateral roots were fewer (sometimes only 4 in number) the taproot gave rise to many strong, well-developed laterals. The taproot and the large adventitious roots from the stem varied from 1.5 to 3 millimeters in thickness, usually the taproot having the larger size. Nearly all maintained this diameter for the first 12 to 18 inches of their course and some maintained it through a distance of 5 feet or more to their ends. Occasionally, a root would taper to 1 millimeter in thickness and then again enlarge. The taproot alone pursued a generally vertically downward, although somewhat meandering, course and extended more deeply. Most of the other main roots ran 1 to 3 or more feet in the surface 6 to 12 inches before turning downward. They sometimes forked, however, and gave rise to groups of three to five branches which ran more or less vertically downward into the third or fourth foot of soil. Moreover, nearly all of these roots gave rise in their horizontal course to vertically descending, major branches. Some of these grew only 6 inches from the taproot, others grew over 3 feet from it. These roots, with-their branches very completely occupied the soil to the working level at 45 inches (Fig. 58). Fig. 58.--The great extent of a maturing lima bean plant is here shown. Two hundred cubic feet of soil were ramified by the roots of a single plant. The rate of branching was somewhat variable, both as to number and length of laterals, but it was always profuse. A rate of 6 to 12 per inch was common, and 13 to 16 per inch not unusual. The smaller branches ranged from 0.1 to 5 inches in length. Most of these, especially the longer ones above the 2.5-foot level, were supplied with laterals of the second order at a similar rate. Rootlets of the third order were not uncommon. Longer laterals, many of which have already been mentioned as descending vertically, were rebranched like the main roots. Although the first few inches on the main lateral roots were not so well furnished with branches, this area was extremely well occupied by short laterals (0.5 to 2 inches long) arising from the taproot. For example, 72 of these were found between depths of 3 and 9 inches. These thread-like outgrowths were usually unbranched. Between the depths of 8 and 15 inches the roots were only about half as numerous, usually I to 4 inches long with 10 to 15 branches per inch. These were rebranched often to the second order, thus forming an efficient root network surrounding the taproot. Below this to a depth of over 2 feet branching was again more abundant and the branches averaged much longer. They were very short and little absorption occurred below the 4-foot level. Summary.--The root system of the lima bean is very similar to that of the kidney bean. In early growth it develops a taproot with very abundant horizontal lateral branches; others arise adventitiously from the base of the stem. The root, system is conical in shape, the base of the inverted cone beginning, about 2 inches below the soil surface. During the 5 weeks following, about eight strong lateral roots spread 2 feet or more in the surface foot of soil, branching profusely. Turning downward they end in the second or third foot. Large numbers of smaller laterals fill the soil near the taproot. The taproot is also covered with long laterals almost to its end, approximately at the 3-foot level, which greatly increases its absorbing area. By the end of blossoming the root system has made further marked growth. Widely spreading, nearly horizontal branches run outward 2 to 4 feet in the surface 12 inches. Then they often turn downward and, like the long laterals arising in their horizontal course, penetrate deeply, frequently far into the fourth foot of soil. More obliquely descending long roots and shorter branches arising from the taproot (which was 5.5 feet long) fill in the remaining soil volume just beneath the plant. Often the major branches are as important as the taproot. Where they are few, the deeper portions of the taproot are better branched. 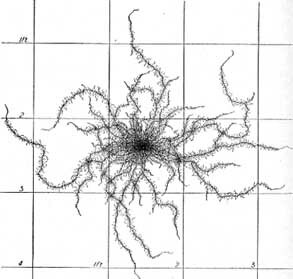 An intricate network of small rootlets occurs throughout the 200 to 225 cubic feet of soil ramified by a single plant. The lateral spread of roots is about 4 feet. This is 1.5 feet greater than that of the kidney bean, and the working depth is about 9 inches deeper. The larger root system of the lima bean correlates with the greater development of tops. In another experiment broad beans were grown in a field of loam soil. When the plants were 4 to 5 inches tall, the upper lateral roots were cut close to the plants to a depth of 6 inches. This was done at midday early in June. The weather was clear and hot, following ample rains. The plants soon wilted and, in fact, wilting was noticeable for several days. On some of the plants the lower leaves died. The plants grew poorly and had increased very little in height by July 1 when a second, similar cutting was made. They did not wilt following the second cutting, but even a month later they were much more poorly developed than uninjured plants. On the other hand, cutting of the taproot of other plants below the main branches, i.e., at a depth of 6 inches, did not result in wilting although at the time this was done the soil was quite dry. It was demonstrated by other experiments that deep, tillage gives greater returns where the plants are widely spaced than where they are grown closely together. 85 The relation to root injury is apparent. Other investigations on the broad bean showed that it was most profusely branched to a depth of 4 inches and that the largest laterals had a length of 10.5 inches. The number of laterals of the first order was about seven per centimeter of taproot in the upper portion of the root system but on the lower part there were only about two per centimeter. The deeper portion of the root system was only 29 per cent as well branched as the shallower part. Thus, in comparison with the pea examined at the same time, the maximum length of branches was 1.1 inches less, but the number of primary laterals was somewhat greater in the surface soil. On the primary and the secondary laterals of the pea the branches were two to three times as numerous in the deeper soil and the total branching 23 per cent greater (relative to the shallower portion of the root system) than in the case of the bean. A survey of these investigations on the rooting habits of beans points clearly to the fallacy of the current idea, commonly expressed in the literature on vegetable growing, that beans are a shallow-rooted crop. It is true that a portion of the root system lies just beneath the surface of the soil, but the roots also extend widely and penetrate deeply. Among the varieties studied considerable differences were found in the rooting habit and the ability of the root system to adjust itself to different soil environments has been shown. Further studies of these and others of the very numerous varieties will throw much light upon root behavior under various conditions of growth. How the roots respond in their distribution and activities under dry-land culture, irrigation, various methods of seed-bed preparation, depth and method of distributing manures and other fertilizers, depths of intertillage, etc. are problems awaiting further investigation. 85 More attention should be given to their activities in the subsoil. These will be found not only of great scientific interest but may lead to modifications and improvements of current cultural practices. 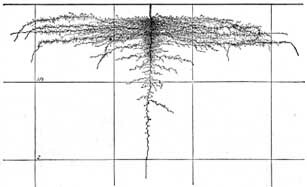 Root Habit in Relation to Cultural Practice.--The widely spreading roots of beans, the fact that they are richly furnished with tubercles, and the plasticity of the root system in adapting itself to various environments, all lead to the conclusion that beans will grow well in various types of soil. The fact that they do quite well in practically all types from light sandy loams to heavy clays is well known by most gardeners. That the common beans will thrive on poor soils better than many other crops is expressed in the vernacular, "It is good enough for beans." In the North, however, clay soils may be too wet and warm too slowly, and sandy soils may be too droughty. The plants respond in root development and yield when grown in moderately fertile, carefully prepared, well-drained but moist and properly cultivated, non-acid soil. The bean plant is especially sensitive to poor tilth and rough treatment at the time of cultivation. A good seed bed, well pulverized and firmly packed, permits the maximum utilization of the soil nutrients and moisture throughout the entire growing season. In a poorly prepared seed bed the fibrous roots may die and the plant be handicapped by the partial or complete loss of that portion of its root system occupying the richest part of the soil. On soils that are too rich there is a tendency toward too great a growth of vines and, undoubtedly, a compact root system. Since both kidney and lima beans are epigeal in habit and the large cotyledons must be pulled out of the ground, thorough preparation and good tilth of a well-compacted seed bed are essential. A deep, mellow soil promotes deeper root development and at the same time a more thorough occupancy of the richest portion of the substratum, the surface soil layer. This is due in part to better aeration and partly to better water-holding capacity of the soil. In dry-land farming this early stirring of the soil forms a dry soil layer. If this is maintained, the plants will root only below this layer. Otherwise many surface roots would undoubtedly die as a result of later drought. Under irrigation, where a furrow is to be made between the rows to permit watering while the crop is growing, it is the practice to cultivate deeply this part of the soil. This is a precaution to keep the soil dry and thus prevent the roots from extending into the area so that they will not be injured when the furrow is opened. 114 Hoeing the soil about the stems promotes the production of very many adventitious roots. Subsoiling to a depth of 16 to 18 inches is advocated to increase moisture penetration in more and districts. 55 In certain sections where beans have been grown for many years, it is necessary to practice crop rotation as a preventive measure against dry root rot. This disease is caused by a soil-borne fungus (Fusarium martii phaseoli). It appears as a reddish-brown dry rot at the base of the plant and often causes the loss of almost the entire portion of the finer roots as well as the shriveling of the end of the taproot. Drilling the seeds 4 to 6 inches apart gives a better distribution of the plants than placing five to eight seeds in a hill 2.5 to 3 feet distant. This former method at least partially eliminates crowding. Experiments have shown that where field beans were planted at the rate of five per hill, and the hills spaced 18 inches apart in rows 3 feet distant, the yield was hardly more than one-half of the yield where the beans were spaced 6 inches apart in the row. 28 Garden beans are usually spaced too closely 38 as may be readily seen by an examination of the rooting habit.